Glenn Beck likes to argue that this year's midterm elections, and really the choice about the direction America should take, is about opposing the regulatory progress that is needed to curb the excesses of Wall Street financial institutions and unscrupulous corporations. On his radio program today, September 20, Beck attacks the President's choice, Elizabeth Warren, to form the consumer protection agency that is mandated by the financial reform bill. After this bill was passed, Beck - on his Fox show - threw the bill toward the camera and declared it to be the "end of the Republic." Actually, it is the end of Wall Street's "freedom" to use our mortgages in casino games and extract fees from consumers using credit cards and other financial products. Beck: Now let me introduce you to who Elizabeth Warren is. Two months ago this is somebody that the president did not, did not appoint as the head of this new Consumer Protection Agency because if he did, he would have to go through the Senate confirmation process. So instead he made her, I guess, executive secretary and the only employee. So by default she's the head. But he can just appoint her to that role. There is no single individual who represents the financial interests of middle class Americans, including the listeners of Beck's radio and television programs, more than Elizabeth Warren. The following clip is extracted from The Rachel Maddow Show from September 17th. Beck's form of "populism" is far from the interests of the American people. Beck stands with the fat cats of Wall street, not the consumers of Main Street. How long will it take his followers to figure out that he does not stand with them; Beck stands with Beck and other millionaires like him. Actually, the video pretty much confirmed what Glenn's been saying about her. She has the typical mind of a liberal: Doesn't trust the American people to use their heads to avoid situations involving debt; demeans companies that DO lay it out for the people to read if they'll just read it regardless of the size of the print (really, its the consumer's fault if they don't think things through, let those persons fail); acts like the companies that DID NOT force people into situations involving debt were somehow the companies that put the consumers in the situation. Really, she is not impressing me as a American Hero. Even though Beck is 100% on American history, he only speaks for the white side of our Presidents, the Declaration of Independance and so on. I've never heard him talk about the Native American's part in helping to form our government in it's early infinancy. And they DID have alot to do with it. As far as Glen Beck getting fat off his followers...When he put out so many books so fast, well if I did, I'd want to be paid for them too. He got popular about as fast as Obama, out of nowhere he came! But when he started the insider extreme making it $6.95 a month to listen in on; in part of his tv shows, radio shows, his concerts et al charging for each and every thing he did or thought. I called it quits except for his free emails. If folks would calculate 4 million people buying the monthly dues by $6.95; roughly 27 million dollars(My calculator is old, like me and may be off a little, forgive me and he may not have 4 million total followers buying in to the scam). He found a marketable product and ran with it. It seems to be quite successful for him. There are others out on the internet doing the same thing as he, but he got there first with the right connections, so he has the cash cow. If folks would read the Constitution, Bill of Rights etc. in their homes, and had the intelligents to dissect them and read up on the history, they wouldn't have the time he does to ponder and reach the audience to effect the votes to bring the power back to We the People. The Democrats want Government control of the little people;as in Socialist-Marxist-Communist Obama wants to install in Government the dreams from his father to honor him. If anyone did any comparison between his book and all that he's done, you will see he's doing just that. Now, the DSA (Democratic Socialists of America) also known as the Communist Party of the USA(cpusa.org) are happily helping him out, but not for the same reason as his. I think we need to take each name he appoints and the czar's and really get to know their past, their conections to one another and what they want to do. You'll see they have been since the 20's infiltrating our Government, till present day. They needed a puppet to make it to the President position. Then, quietly become known to him and by word of mouth promote each person so he appoints them to a post. Most of his czars he already knew from his own past history. It's kind of like, "We'll overthrow the Government without firing a shot". The Weatherman Underground figured it out and stopped bombing and started inventing causes (Mainly for the poor and welfare folks) that became their cash cows existing off Government money. Then they got into politics, Chicago, New York. To the people not in government, you know, the people nobody in Government care's about; that know enough about the Constitution; you know the clause about the Government getting too big for their britches that the We the People have to step in to set it straight, but don't have a voice to collect themselves into, say, the Tea Party,Glenn Beck has been a big help in getting them started. Then We the People had direction. We the People figured out it's the vote to defeat them, and it isn't going to stop with the next election. We the People are getting involved and need to stay involved, no matter which way they vote. So in a way Beck is God sent for those of us with no direction, to get us organized. Nice try but Glenn's truth is stronger then this sites deceptive "niche reporting". By-the-way, does Soros pay you monthly, bi-weekly, or weekly? Or are you at an office at the Apollo Alliance? Just wondering. Anonymous said..."Actually, the video pretty much confirmed what Glenn's been saying about her. She has the typical mind of a liberal...."
That's NOT what Beck's been saying about her or anyone else in this Administration. He calls her a "radical." Financial corporations have been sticking it to Americans in many ways for years, and she's going to be instrumental in changing that. She's an American heroine to me. Lakota lady, Beck gets history wrong a lot. Glenn Beck is great at getting people to support a reactionary agenda that seeks to push the policies of the U.S. back into the 19th Century. You know, when the whites conquered the natives here and decimated their population. YOu want direction, Lakota Lady, join with people who support your cause. The Tea Party is not them. Anonymous, I work a full time job performing a critical service for clients in a vast swath of Upstate NY. 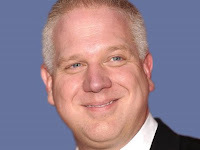 The Glenn Beck Review is an independent, unfunded service to the public warning all who read this that Glenn Beck is a liar, a hypocrite and a charlatan. I have documented these three claims repeatedly here, and no one has been able to show that I have something significant wrong. When I do get something wrong, unlike Glenn Beck, I make the corrections. This is called maintaining credibility, something that Glenn Beck does not have a shred of.